Monday is a big day for nearly 70 Valley veterans. 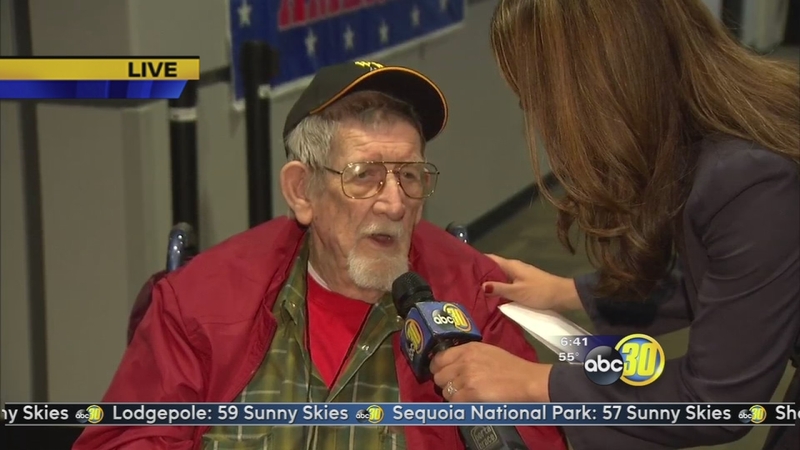 FRESNO, Calif. (KFSN) -- Monday is a big day for nearly 70 Valley veterans. In just a few hours they'll be taking off on the journey of a lifetime on the Central Valley Honor Flight. In just a few hours they'll be taking off on the journey of a lifetime on the Central Valley Honor Flight. This is the Central Valley Honor Flight's sixth trip -- and every trip is marked with important stories of men and women who have bravely fought for our country. It's now their turn to see their World War II Memorial. Monday's flight consists of 68 veterans from 27 hometowns in 12 different counties. There is about 5 women and 63 men representing Army , Navy, Marine Corps, Coast Guard, and Army Air Corps/Air Force. You can help honor these veterans with a heroes homecoming. It is 6 p.m. on Thursday at the Fresno Yosemite International Airport.